I still think that fast food inasal has murdered the idea of proper inasal. 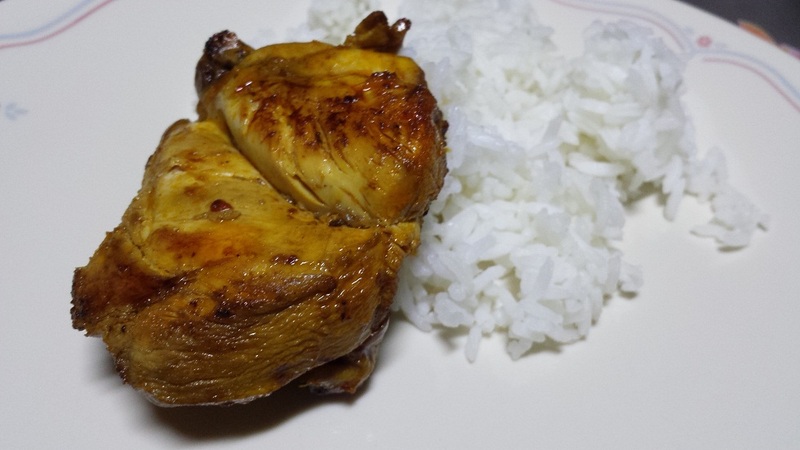 Though I thought that my last inasal tasted good already, it doesn’t really compare to this one I made right now. Well, I do have to admit that I don’t remember the flavor of the last one I made, it being years ago. But it just looked like barbecued chicken, not the orangey signature of inasal dishes, supposedly. I scanned some recipes before I made this and it was only I got home that I ended up wanting to make it. First, I used some annatto seeds. (I actually used annatto powder and added it to the oil but I then bought annatto seeds to make this one) This was added to some oil and heated all of it. The color would then transfer to the oil, with this slight flavor added to it as well. Set aside. I then use calamansi and vinegar as the base of the flavors. Yes, a mix of two souring agents. The calamansi added some citrusy notes, while the vinegar added a different flavor altogether. I then added soy sauce, salt (if all soy sauce, it may come off too dark), a bit of sugar, black pepper, and garlic. I added some chili flakes, just because. Then mix together with the strained oil. Taste and adjust as needed. Then pour over the chicken and marinade for at least an hour. Either grill this, or as we do, get some of the oil in the marinade and pan-fry it. Heat the annatto seeds in the oil and allow the oil to get the color. Set aside. Mix all the next list of ingredients, then add the annatto oil (strained of the annatto seeds), and taste. It will be more sour than salty. And just adjust to your liking. Marinate the chicken for an hour, to overnight. Grill or pan fry (using some of the oil in the marinade). 🙂 Serve with rice.